Every 10 years or so there is a banking crisis. We are due. People deposit money, bankers lend it out, keeping the mortgage on their books. Easy Peasy. As the folks from Brookings point out, it’s not that easy in these dark days of financial engineering. George Bailey’s handshake, promise and maybe a few words on a document to be signed by the borrower which meant simply, “I’ll pay you back,” has become a financial instrument, to be traded and hypothecated by faceless financial bureaucrats, each one taking a sliver of profit off the top. The literature has been largely silent on the liquidity vulnerabilities of the short-term loans that funded nonbank mortgage origination in the pre-crisis period, as well as the liquidity pressures that are typical in mortgage servicing when defaults are high. These vulnerabilities in the mortgage market were also not the focus of regulatory attention in the aftermath of the crisis. Of particular importance, these liquidity vulnerabilities are still present in 2018, and arguably the potential for liquidity issues associated with mortgage servicing is even greater than pre-financial crisis. These liquidity issues have become more pressing because the nonbank sector is a larger part of the market than it was pre-crisis, especially for loans securitized in pools with guarantees by Ginnie Mae. George Bailey and his little financial institution are nowhere to be found. The authors quote former Ginnie Mae president Ted Tozer concerning the stress between Ginnie Mae and their nonbank counterparties. Tozer said these words in 2015. The mortgage engine is built for perfection: a thriving economy, with low interest rates, allowing everyone, from the mortgage borrowers to the credit line providers and securitizers to keep their promises. However, the world is anything but perfect. Nonbank mortgage providers essentially borrow short and lend long, using warehouse lines of credit from banks to fund mortgages. From 2012 to the third quarter of 2017, commitments on warehouse lines has increased 70 percent. Of course, if all goes well, a mortgage will be sold quickly into the secondary market (on average 15 days) and the line will be reduced. The Brookings authors identify three vulnerabilities in the process. 1) margin calls due to aging risk (i.e., the time it takes the nonbank to sell the loans to a mortgage investor and repurchase the collateral) and/or mark-to-market devaluations, 2) roll-over risk and 3) covenant violations leading to cancellation of the lines. These vulnerabilities are very real, should there be a sudden increase in interest rates or other significant change in the market that causes collateral values to drop. Most nonbank lenders have multiple warehouse lines. However, cross default provisions will trigger a scramble amongst warehouse lenders for a mortgage originator’s assets should it default on one of its lines. These sources of warehouse credit began to dry up rapidly in the run-up to the financial crisis as the slowdown in the securitization markets made it difficult for the nonbanks to move loan originations off the warehouse lines and the premiums paid for subprime warehoused loans evaporated. In 2006:Q4 there were 90 warehouse lenders in the U.S. with about $200 billion of outstanding committed warehouse lines; however, by 2008:Q2 there were only 40 warehouse lenders with outstanding committed lines of $20–25 billion, a decline exceeding 85%.34 By March of 2009, there were only 10 warehouse lenders in the U.S. In addition, runs on SIVs led to the collapse of this form of warehouse funding by the end of 2007 … and it has not returned as a funding source post-crisis. Mortgage servicers have liquidity issues because they are required to continue making payments to investors, tax authorities, and insurers if mortgage borrowers quit making payments. Servicers are eventually reimbursed for these “servicing advances,” however, they need to finance the advances in the interim. For example, servicers were stressed last year when hurricane victims were allowed payment forbearance by Ginnie Mae and the GSEs. Fortunately, the servicers were geographically diversified enough to manage through the strain. Nonbanks are vulnerable to macroeconomic shocks, rising interest rates, home price declines and job losses, often with a bare minimum down payment. This is happening while debt-to-income DTI ratios are on the rise (Fannie Mae increased its DTI ceiling from 45 percent to 50 percent last July 29) and median FICO scores are dropping. 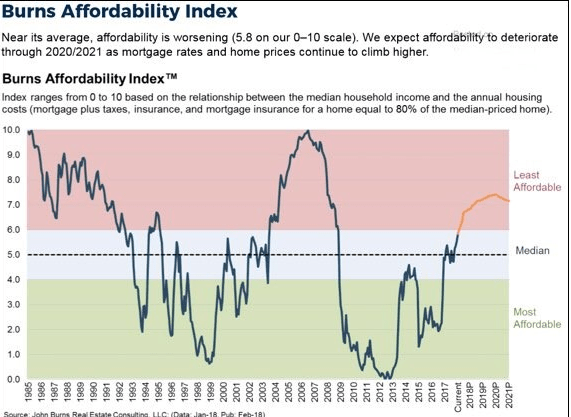 This is hardly surprising given homes are not affordable. The crash clock is ticking.